Solo female travel has become popular in the past decade. With the rise in internet, smartphones, and global wifi availability, this trend is going to continue. There has been a tremendous growth in the women-only travel companies. Women have embraced the wildness. 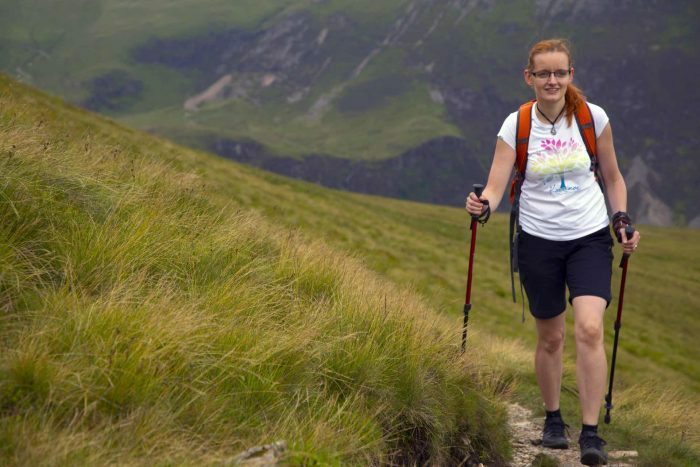 They are proving that women have guts to explore the world on their own. Cheers everyone! A woman can enjoy herself without having a male travel companion. That is what women have effectively proved. Women are contributing more to the global travel economy than men. They are expected to reach $125 billion by 2016. Traveling solo has a lot of reasons. 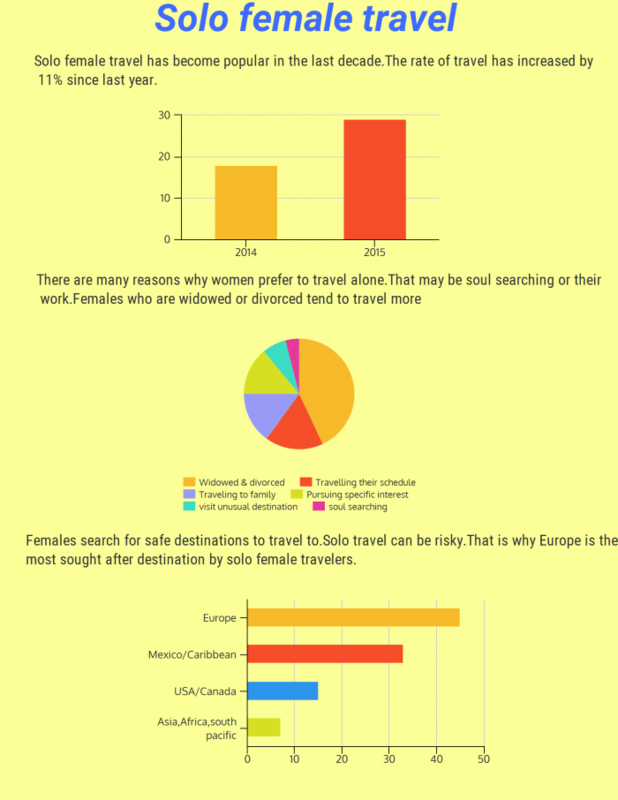 The above infographic will give you information on the increase in solo female travel, reasons, and popular travel destinations. Women can face a lot of problems while traveling alone. That is why it is important that they choose safe destinations when starting solo. Europe is a good first choice, although, it goes without saying that every foreign destination is a little risky. Another interesting thing to note is that the majority of solo female travelers are from European countries. Asia and Africa are not popular destinations with women traveling alone. For now, these are considered less safe. Most women can face a lot of problems when traveling alone. 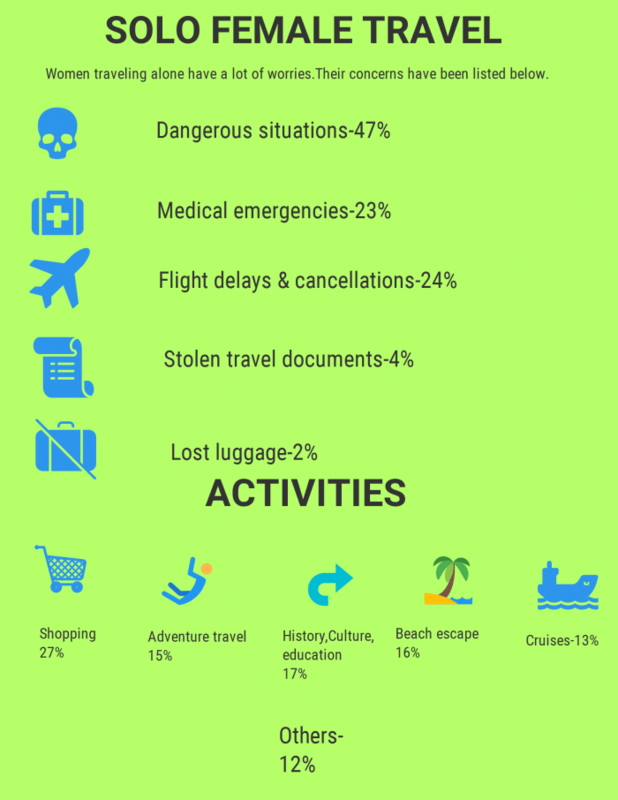 When asked about major concerns when traveling solo, most women responded with “being in a dangerous situation”. But today, many women are visiting extreme, remote, and previously unexplored locations. They are participating in all kinds of adventurous activities. In short, women know how to have fun one their own. 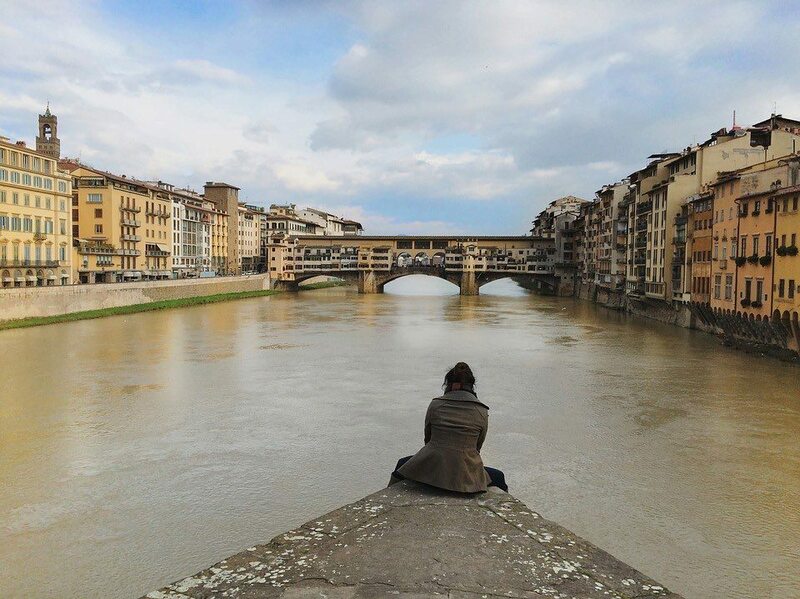 Many such solo travelers say the freedom that they feel when traveling alone is priceless. You might think that women are only good at shopping on a trip. Think again. It is reported by the travel booking companies that 17% of solo female travel are related to history & education. Women can also be adrenaline junkies. They love adventure sports. 15% of women travel for adventure sports. Solo female travelers are from every age group. The women who travel most are widowed or divorced. Modern women have become sophisticated and self-reliant. That is the reason they are unafraid of traveling alone. The age group 45 and above makes 55% of the solo female travel population. This age group might also hint at the time when most people think they need a break from their monotonous life. 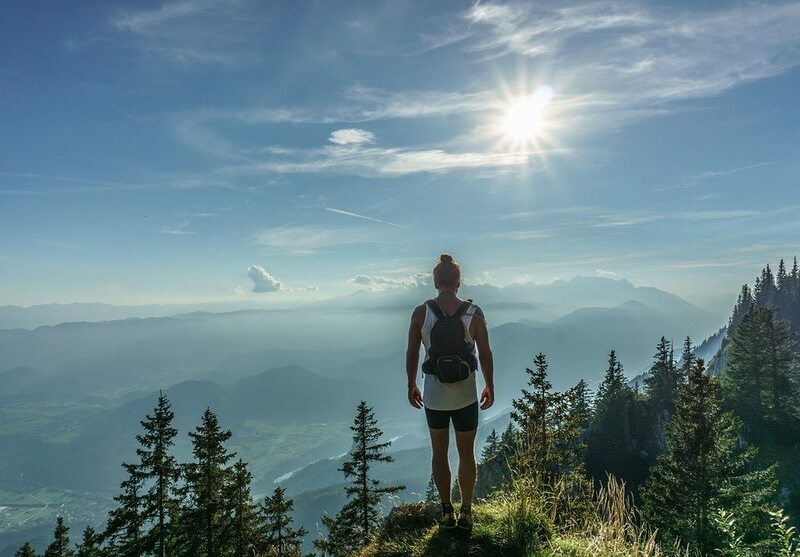 The biggest myth that most solo travelers are a 26-year-old dude with no money is a total lie! Various travel reports* show that 73% of females prefer to travel alone than their male partners. It is a 45-year-old female traveling solo rather than a virile young male. Wanderlust does not discriminate based on gender. This new trend has been already observed for a few years now. With the rise of social media, everybody now wants to posts pictures from their heroic journey. The rise in solo female travel is a boon for the travel industry and is a good thing for the entire travel loving community! There are various sources that confirm these facts and figures. For more in-depth study, please refer to Harvard Business Review (women spending power), Forbes (on spending power and influence on purchasing decision), Travel stats from market researching firms such as Yesawich, Pepperdine, and Brown & Russell, Travel Industry Association (USA), Travel Guard polls (Travel insurance company) and other big online travel booking companies.